Bwindi Impenetrable National Park in Uganda is home to an estimated 400 mountain gorillas, nearly half of the global population. 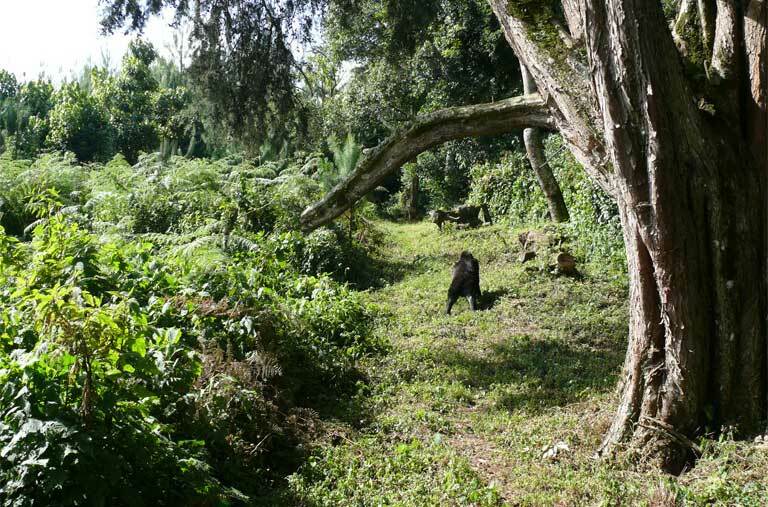 The park is surrounded by agricultural plots which the gorillas raid, making gorilla-human conflict a continual problem that threatens conservation efforts. Tea plantations — widely regarded as good gorilla buffer crops — were planted on Bwindi borders, but failed to end the raids. 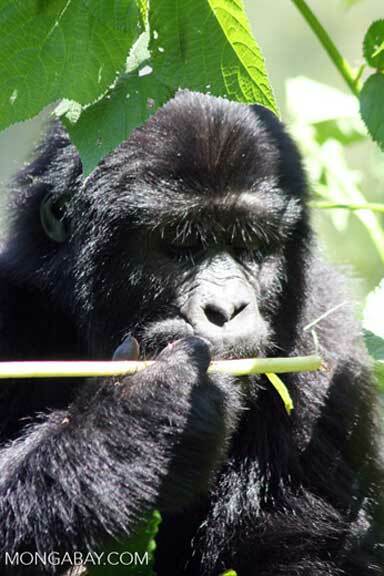 A study found the problem: gorilla-attracting herbaceous plants interspersed with the tea. A tea mono-crop reduces crop raids. Where the Bwindi Impenetrable National Park ends, crops and gardens begin — as do wildlife conflicts with local communities. Crop raiding mountain gorillas who venture beyond the confines of the park are a major problem that threatens the species’ conservation. Attempts at keeping the gorillas within the park haven’t solved the problem. A recent study published in Animal Conservation found solutions that, if applied properly, might do the job. Uganda’s Bwindi Impenetrable National Park (BINP) is an island of biodiversity — roughly 330 square kilometers (128 square miles), surrounded by one of the highest rural human population densities in the world with more than 350 people per square kilometer in some places. The park is regarded as one of the most ecologically rich areas in Africa, with 120 mammal, 348 bird, 220 butterfly, and over 1,000 flowering plant species. Bwindi is also home to nearly half the global population of mountain gorillas (Gorilla beringei beringei), classified as Endangered by the IUCN. At the last census in 2011, there were an estimated 400 of the great apes within the park’s borders. 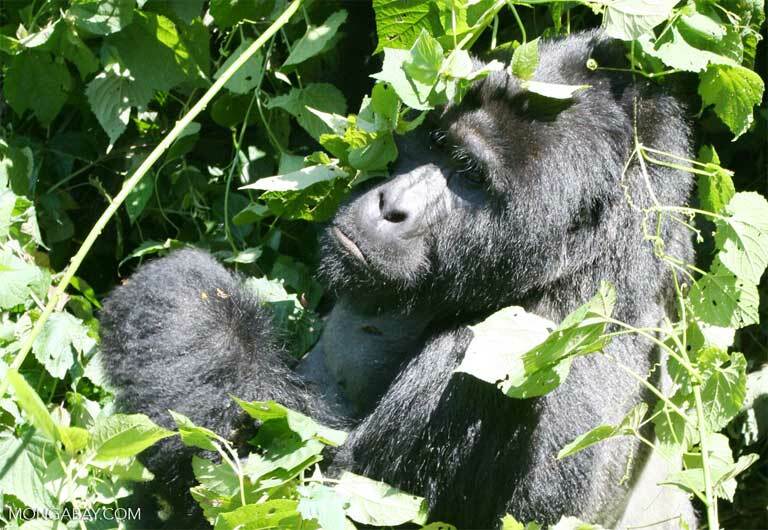 Unfortunately for the gorillas and their human neighbors, the species isn’t staying put. Human-gorilla conflict is a thorny multidimensional problem. Damage to crops, financial loss and physical harm are just some of the potential dangers that local people face. 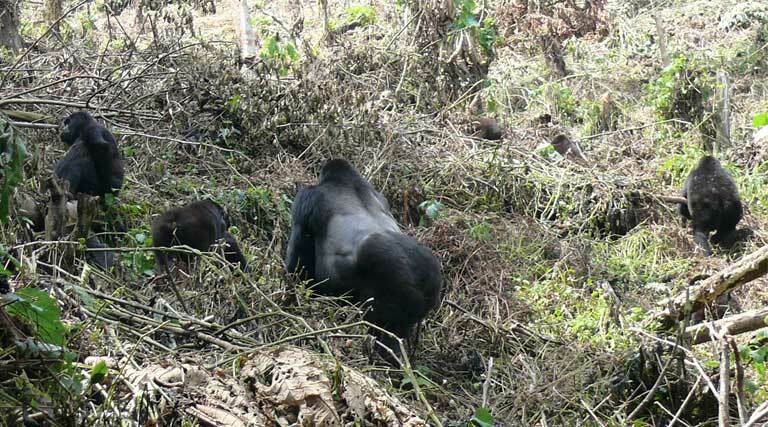 The gorillas confront risks as well, including harassment or even death in retaliation for crop damage, as well as the danger of diseases contracted from humans or livestock. In an attempt to halt conflicts between local farmers and Bwindi’s foraging gorillas, several conservation groups joined together to buy up a swath of land lying between the park and the communities to act as a buffer zone and prevent gorilla raids. The partnership was led by the Ugandan Wildlife Authority (UWA), assisted by the International Gorillas Conservation Programme (IGCP), along with a host of international NGOs. The 330-meter (1,082 feet) wide buffer zone was split into two areas, the inner zone which touched upon the park and that was supposed to be actively managed by the UWA, and an outer zone that remained under the ownership and management of local communities. The project failed. The gorillas still ventured beyond the buffer zone to make community raids. In a review of the experiment, the IGCP found that the disappointing results were largely due to a “striking” failure to properly manage the inner zone. In the original plan, this area stretching 200 meters (656 feet) from the park boundary, was supposed to be “actively manipulated so as to prevent the regeneration of natural forest.” However, this did not occur. Gorilla habitat had been allowed to regrow, and the gorillas quickly moved back in, using the buffer as a base for raids. Tea plantations: buffer crop or gorilla buffet? The failed buffer was abandoned in 2013 to make way for community managed tea plantations. Tea is known to work as a buffer crop against gorillas. But this strategy also failed to keep the gorillas out of local fields and gardens. In 2015, researchers undertook an expansive study to find out why the gorillas were still raiding farm fields and gardens, despite the presence of the supposed buffer tea crop. Their conclusions were recently published in the journal, Animal Conservation. 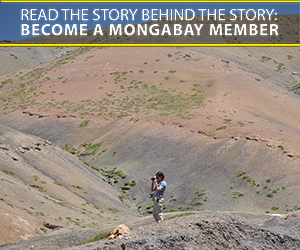 “It has been shown that tea plantations, in other locations, are in fact a good buffer crop,” Nicole Seiler told Mongabay.com. She is the lead study researcher and a doctoral student in the Department of Primatology at the Max Planck Gesellschaft Institute for Evolutionary Anthropology. Past studies, including one done by the IUCN and released in 2009, found that tea is an effective deterrent against chimpanzees. The same appears to hold for gorillas; they don’t like to cross tea plantations and don’t feed on the crop. However, as with the original buffer experiment, the Bwindi researchers concluded that proper management determines the overall effectiveness of the strategy. If tea plantations are planted strictly as a mono-crop, they protect against the great apes. But interspersing other crops with and near the tea, creates problems. “It’s basically like a fence with huge holes, and a fence with huge holes doesn’t help,” Seiler said. At Bwindi, the locals had mingled the tea plants with masses of herbaceous plants, the same food that gorillas feast on in the park. Those plants acted as a gorilla lure, according to Seiler. If left unchecked, these herbaceous crops can proliferate within tea plantations, turning the buffer zone into a gorilla buffet. The researchers concluded that tea plantations are indeed effective buffers against gorillas, just so long as herbaceous plant regrowth is prevented. “This study, by really looking at the detail, we’re saying tea can serve as a good buffer crop, but you have to manage it properly,” Martha Robbins, also of the Max Planck Gesellschaft Institute, told mongabay.com. The two scientists also tried to shed light on a second primate mystery: why do some gorilla groups crop raid, while others don’t? A seemingly obvious hypothesis worth testing was that habituation of gorillas to human communities was a prime suspect for conflict behavior. 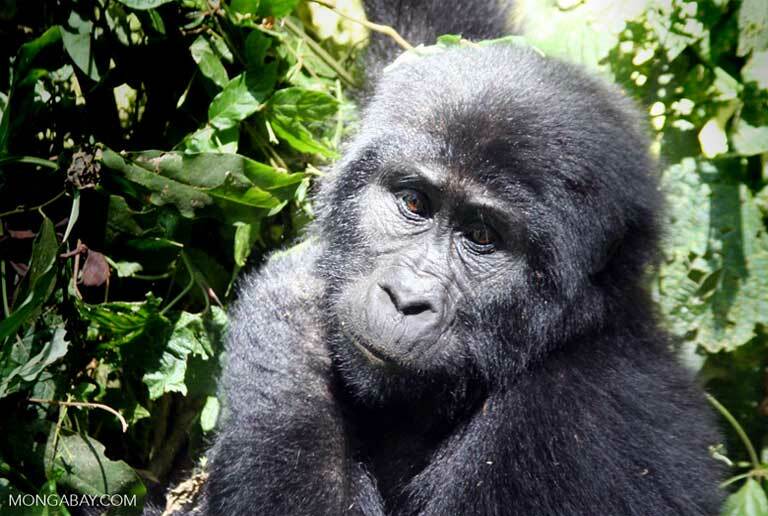 Within Bwindi’s borders, there are 36 gorilla social groups, plus 16 solitary males. Of this number, 13 groups have been habituated over time to human presence. 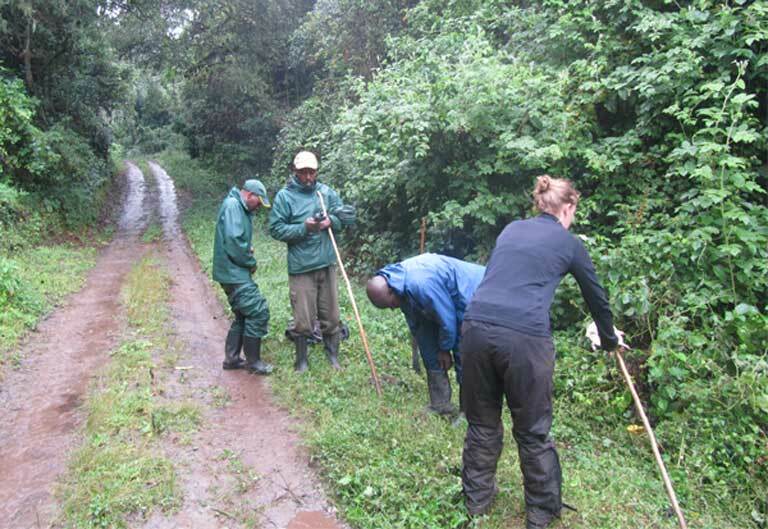 These groups are regularly visited by researchers and tourists who pay to trek through the forest to watch the gorillas. “I would say without a doubt the groups that are habituated are going to be less afraid of people, so they will be more likely to crop raid,” Robbins stated. But as it turns out, the issue is more complicated. In discussion with park authorities, Seiler and Robbins learned that unhabituated groups also venture out of the park to raid. The Orugozo group, for example, was habituated only recently in the last several years but conducts crop raids, whereas the Kyagurilo group, habituated since the early 1990s, has never been recorded to crop raid. Robbins, who has studied gorillas across Rwanda, Uganda and Gabon, warns against too quickly jumping to conclusions with regard to these complex animals, or with applying the same control methods with different populations and at different locations. “You know, there is the Shakespeare saying, ‘a rose is a rose is a rose,’ well, a gorilla is not a gorilla is not a gorilla,” she said. If Bwindi’s gorilla populations are to be conserved long term, it is imperative that human-gorilla conflict be lessened. Finding permanent solutions is just as important for farmers and gardeners — some of the poorest in the region, who can suffer devastating financial losses from gorilla raids. Both Robbins and Seiler remain optimistic for the future of Bwindi’s mountain gorillas, but stress caution and the need for continued research into species behavior. “I can’t say for all gorillas, we now need to plant tea. I can’t say that because I don’t know,” Seiler said. Both scientists urge getting creative with conflict resolution strategies, and to pay close attention to the details. In Bwindi, the pressures of an increasing human population mean that the gorilla conflict problem will not go away any time soon, and that innovative solutions will need to evolve as new conditions and pressures develop. Seiler, N and Robbins M, M. (2015) Factors Influencing on Community Land and Crop Raiding by Mountain Gorillas. Animal Conservation. 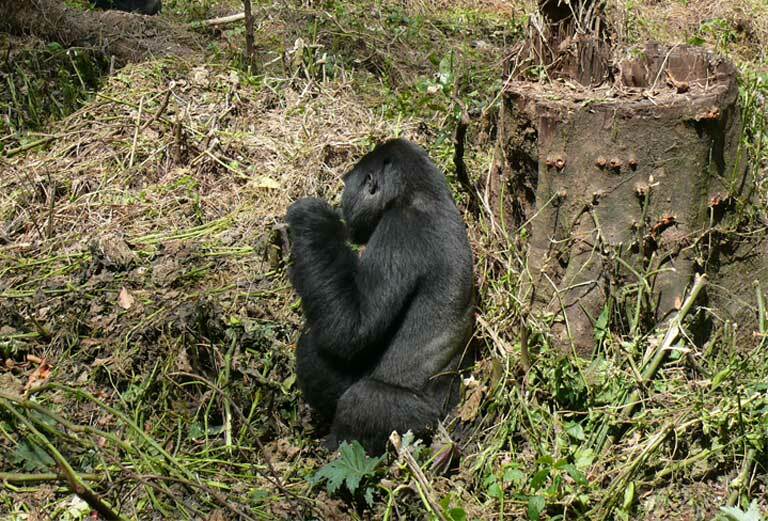 Maryke, G and Rutugarama, E. (2011) 20 years of IGCP: Lessons Learned in Mountain Gorilla Conservation. Kigali, Rwanda: International Gorilla Conservation Programme.